It is common practice nowadays for adaptation critics to denounce the lack of meta-theoretical thinking in adaptation studies and to plead for a study of ‘adaptation-as-adaptation’; one that eschews value judgments, steps beyond normative fidelity-based discourse, examines adaptation from an intertextual perspective, and abandons the single-source model for a multiple-source model. This study looks into a research program that does all that and more. It was developed in the late 1980s and presented in the early 1990s as a ‘polysystem’ (PS) study of adaptations. Since then, the PS label has been replaced with ‘descriptive’. This book studies the question of whether and how a PS approach could evolve into a descriptive adaptation studies (DAS) approach. Although not perfect (no method is), DAS offers a number of assets. Apart from dealing with the above-mentioned issues, DAS transcends an Auteurist approach and looks at explanation beyond the level of individual agency (even if contextualized). As an alternative to the endless accumulation of ad hoc case studies, it suggests corpus-based research into wider trends of adaptational behavior and the roles and functions of sets of adaptations. DAS also allows reflection upon its own epistemic values. It sheds new light on some old issues: How can one define adaptation? What does it mean to study adaptation-as-adaptation? Is equivalence still possible and is the concept still relevant? DAS also tackles some deeper epistemological issues: How can phenomena be compared? Why would difference be more real than sameness or change more real than stasis? How does description relate to evaluation, explanation and prediction, etc.? This book addresses both theory-minded scholars who are interested in epistemological reflection and practice-oriented adaptation students who want to get started. From a theoretical point of view, it discusses arguments that could support the legitimacy of adaptation studies as an academic discipline. From a practical point of view, it explains in general terms ways of conducting an adaptation study. Patrick Cattrysse’s work is of utmost importance to Adaptation Studies. As the first extended attempt to develop a rigorous methodology which borrows in very meaningful ways from Adaptation Studies’ cousin Translation Studies, this book should be on every Adaptation scholar’s shelf. 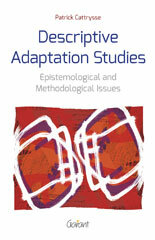 While Hutcheons, Sanders and Leitch, to name but a few, layed the groundwork which allowed Adaptation Studies to establish itself as a field of inquiry in its own right, Cattrysse moves the field into the next necessary stage: that of developing conceptual tools which stand the test of critical investigation and allow Adaptation Studies to move beyond the single case-study approach. This book is a bold initiative: it proposes, and illustrates, a comprehensive new empirical research programme for film adaptation studies, inspired by the way systems theory and norm theory have expanded Translation Studies. One of the book’s unusual strengths is the way the proposal is grounded in a thoughtful theoretical discussion of conceptual and methodological issues, dealing with such notions as theory, descriptivism, definition, diachrony and explanation. This gives the work a significance that ranges well beyond Adaptation Studies alone; it deserves the attention of scholars in the humanities in general. Patrick Cattrysse is an independent researcher. He teaches adaptation studies, narrative studies and screenwriting studies at the Université Libre de Bruxelles, Antwerpen Universiteit and Emerson College European Center.